While most wine drinkers consider Napa Valley synonymous with Cabernet Sauvignon, there was once a time when Petite Sirah was the most widely planted grape in Napa. And there was a good reason for that. It excelled in the valley, especially towards the warmer north end. 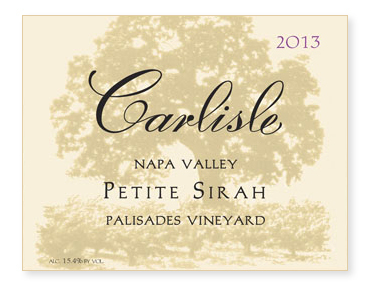 Alas, very little Petite Sirah exists in Napa Valley today. Growers simply cannot ignore the economics of Cabernet Sauvignon. Fortunately, however, a few old plantings still exist, like the dry-farmed Palisades Vineyard just east of Calistoga. Picked September 12th, the wine spent 31 days on the skins to soften the tannin. All French oak, only 20% new. As usual, unfined and unfiltered.